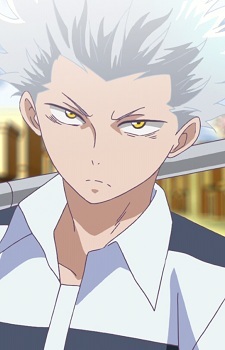 Wolf is first introduced in Blood Lad in episode 2 when Bell mentions the "Book of Human Resurrection", and says that it is in Wolf's territory, an old enemy/friend of Staz. Episode 3 is when he is fully introduced. An experienced and talented street fighter, Wolf is a long time friend and rival of Staz. Wolf was abandoned by his parents for not being a pure werewolf. When Wolf gets over-hyped, he grows claws and he grows a snout. Wolf is a mildly short-tempered young man, but with great ambition. He is very powerful and strong-willed, and thinks very highly of his strength. However, he knows he is not stronger than Staz, but still continues to challenge him to battles as he becomes stronger. The supposed reason to his attempt to conquer all the territory in the Lower Demon World is so that he will prove his strength, and be finally accepted by the same family who abandoned him, including his father, the King of the Demon World Acropolis. Additionally, Wolf demonstrates a very caring nature, despite his "rough" outer personality, as displayed by his actions towards Fuyumi and his friends in danger. He seems to have a small crush on Fuyumi, despite him saying she's not his type.